Dawsons Carpet Cleaning provides a thorough Leather Cleaning Service. Our service uses a leather cleanser which is applied to remove all soiling from the surface of the leather hide. 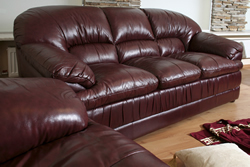 We also nourish and protect your leather sofa. Apply a leather cleaning solution to your leather sofa. Agitating the leather especially the arms and head rests. Removing the soiling from the leather sofa. Applying a nourishing cream and re-sealing of leather with highest quality leather protection.